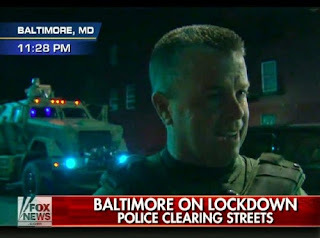 After the “troops” arrived in Baltimore about two hours later, city police “thanked us profusely for being there, apologized to us for having to be there,” Lewis said during an interview on a local radio program. “They said we could have handled this, we were very capable of handling this, but we were told to stand down, repeatedly told to stand down” as rioters laid siege to the city. One important detail disclosed but not dwelt upon by Lewis is that at the time he heard those orders he and the other police were not protecting private property. They were defending the infrastructure of the coercive sector – City Hall and, particularly, Police Headquarters. Building his "Q rating": Lewis on TV in Baltimore. Sheriff Lewis is one of the most self-indulgent media whores in a profession plentifully stocked with such specimens. Predictably, he has become something of a hero to the Authoritarian Right for reinforcing the narrative that Baltimore Mayor Stephanie Rawlings-Blake deliberately provided “space” for looters to “destroy” private property. Ms. Rawlings-Blake is a standard-issue welfare state technocrat, and like most people of that persuasion she grotesquely over-estimates the ability of government to fine-tune mass behavior. Her now–notorious lament that the policy of leaving “space” for peaceful protesters was exploited by rioters was awkwardly phrased and quite typical of people who think that events can be orchestrated by decree. Her meaning was plain to anyone not interested in deliberately misconstruing it to serve partisan interests or to validate racially tinged conspiracy theories. This was the primary reason Sheriff Lewis rallied his “troops” for “urban warfare” and made the trip to Baltimore in his department’s federally subsidized armored assault vehicle. He acted out of tax-feeder solidarity, not in defense of property. A subsidiary purpose of that trip appears to have been using the afflicted city as a backdrop for his self-promoting media appearances. Amid predictable claims on the Authoritarian Right that the riots reflected the devious work of well-funded “outside agitators,” Sheriff Lewis was actually playing that role, which is precisely what we should expect from someone who loots other people for a living. The recently published book In Roads: A Working Solution to America’s War on Drugs features a nearly hagiographical profile of Lewis and his successful efforts to “pull in expendable cash hand over fist.” By exploiting every traffic stop as a “consensual encounter,” police trained in the methods used by Lewis can build legal pretexts for drug searches. 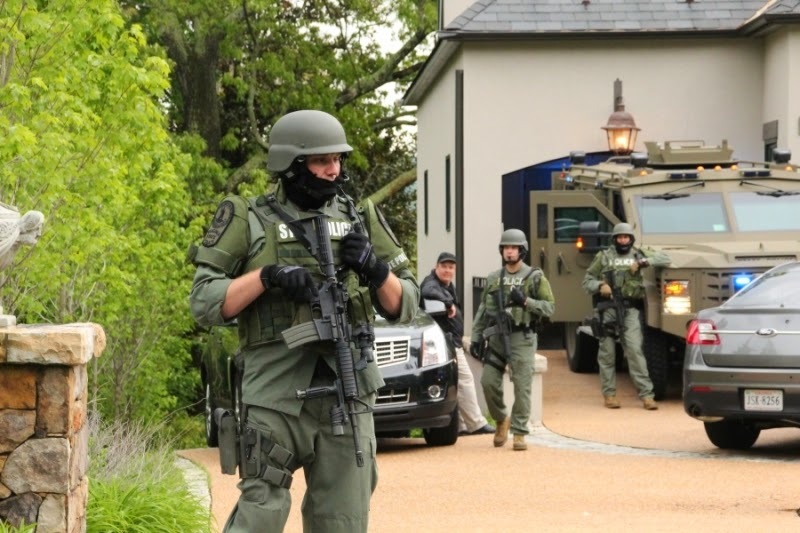 This, in turn, can result in confiscations of cash and salable property that can be spent on “just about anything under a law enforcement agency’s roof,” exults the author, former Kane County, Illinois Deputy Roy Hain. Thanks to his acumen in road piracy, Lewis presides over a department enjoying a huge and recession-proof windfall from the prohibition-inflated narcotics industry. His interdiction efforts do nothing to abate drug use, and they actually help boost the profits of the criminals who have captured that market with the government’s assistance. Criminal kingpins on both ends of this arrangement live very comfortably while street-level petty offenders like Freddie Gray are killed by the retail-level gangs controlled by those elites – including the officially licensed gang called the Baltimore Police Department. "Imperial Mission": Lewis is a global evangelist for prohibition. In addition to using plundered proceeds to buy expensive toys for his comrades, Lewis enjoys a lucrative part-time career as a circuit-riding evangelist for the Prohibition Plunderbund. It is worth underscoring Hain’s description of Lewis’s work as an “imperial mission.” That expression is not used ironically, or disparagingly: Sheriff Lewis, who has been embraced by many self-styled constitutionalists for his supposed opposition to federalization of law enforcement, is an unabashed proponent of a globe-spanning prohibitionist empire. The seminars he conducts overseas are part of an international counter-narcotic effort that grows out of a United Nations treaty – the 1961 Single Convention on Narcotic Drugs. Michael Lewis, in brief, is the very model of a federalized enforcer – a preening, self-enraptured, lavishly subsidized functionary in body armor who is indifferent to civil liberties and sees himself as something of a superhero. Actually, he was a low-echelon road agent in the federal government’s war on the Bill of Rights, adept at devising pretexts to stop harmless people and in using the DEA’s index of “narcotics indicators” to build the stop into a warrantless search and, hopefully, a roadside confiscation. Nazi-era German Ordnungspolizei stop and search a car. Once a pretext stop is arranged, the armed functionary responsible for the ambush assesses the driver and the vehicle for “indicators” – “air fresheners … loose-fitting clothing, day-old beards … food wrappers on the floor.” One informal but inescapable narcotics “indicator,” Goldberg points out, was is ethnic background of the driver. In 1999, the year the Times published that profile, Lewis’s agency was sued for profiling of the racial variety. The Maryland State Police lost that lawsuit, but through the exercise of dilatory tactics it has managed to drag out legal proceedings to this day. Like much of the evil done in the name of law enforcement, the profiling in which Lewis was engaged with the MSP wasn’t necessarily a product of racial animus, but a reflection of federal priorities. Lewis began his career in 1984, the same year the DEA initiated “Operation Pipeline,” through which he and countless others were recruited and trained to be federal counter-narcotics assets. Although he claims a “super-charged understanding of the Constitution,” Lewis has never explained what provision of that document authorized the federal government to criminalize the use or sale of narcotics, or to subsidize state-level enforcement efforts. Although he is among the county sheriffs who loudly announced their intention to prevent federal gun confiscation efforts under Obama, Lewis spent decades seizing guns as part of a federalized state police task force. In similar fashion, Lewis’s supposed hostility toward Washington hasn’t deterred him from accepting battlefield-grade vehicles and weaponry through the Pentagon’s LESO program. The only documented instance of Lewis interposing against Washington involves federal “under-reach,” rather than over-reach. After former Attorney General Eric Holder proposed a handful of trivial and inconsequential “reforms” to civil asset forfeiture, Lewis gloatingly observed that this wouldn’t apply to road piracy operations carried out by police at the state and county levels. Yes, they did "Stop and frisk" in Nazi Germany, too. Whatever current federal policy might be, Lewis and his comrades will continue using the tactics taught to them by the Feds. 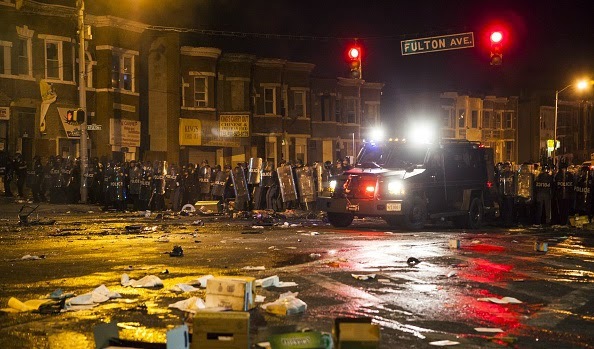 The violent cretins who pillaged businesses in downtown Baltimore embody a localized menace. As a federally licensed looter, Lewis has propagated evil nation-wide by sharing his techniques with law enforcement officers throughout the Soyuz. There is little, if any, practical difference between the system Sharpton has proposed and the one under which we’re living right now. In the Soviet Union, the Cheka secret police inherited many of its rank-and file from the Okhrana, the imperial internal security ministry. 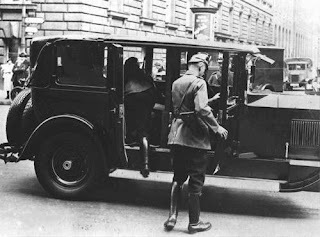 The Soviets repurposed the Czarist police into the Militsiya, which was later folded into the Ministry for Internal Affairs (MVD). In either configuration the “local” police under the Soviets continued their traditional role of investigating conventional crimes. 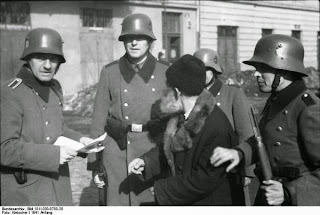 In similar fashion, the German Kriminalpolizei existed long before the Nazis consolidated their Reich, and continued to investigate crimes against persons and property even after being absorbed into the Party-dominated State Security apparatus. 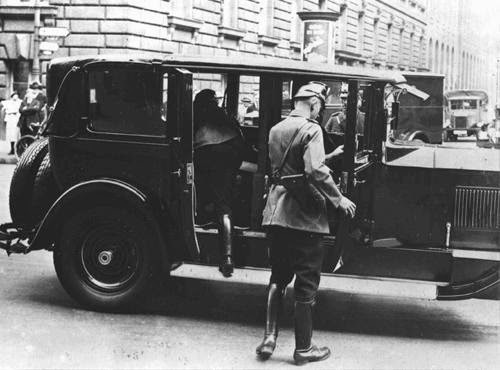 Under either variety of totalitarianism, the “local” police continued to exist as discrete bodies, and even enjoyed a measure of independence – with the understanding that they would be required to assist the Regime’s political police organs identify and deal with subversives. 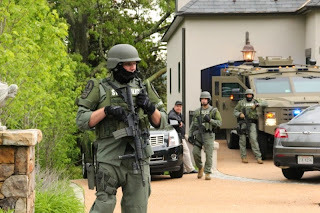 When the KGB or Gestapo stretched out its hand to collect or chastise enemies of the state, the political police did so as part of what in our context would be called “multi-jurisdictional task forces.” Maryland’s Pro-Active Criminal Enforcement team (PACE), in which Michael Lewis played a leading role for decades, exemplifies the federalized task forces upon which every totalitarian police state depends. For the Punitive Right, Baltimore summoned nightmares of federalized “Obamalaw Enforcers” marching in serried rows down Main Street – as if the centralization of law enforcement began with the incumbent president, rather than being inherited and accelerated by him. 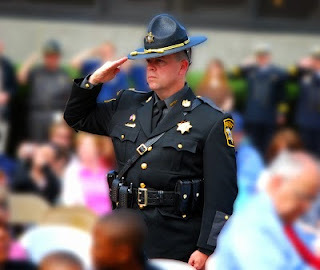 Where federalization of law enforcement is concerned, the likes of Al Sharpton have been talking the talk – but Sheriff Michael Lewis and his ilk have been walking the jackbooted walk. If you can, please help keep Pro Libertate online. Thank you so much!